RAVENOL Vakuumpumpenoel ISO VG 68 is optimum alloyed and high level performance industrial oil with a wide range of applications throughout the industry. It is characterized by good viscosity-temperature behavior, high resistance to aging and reliable corrosion protection. Effective additives ensure even under extreme loads an excellent wear protection. Neutral behavior towards sealing materials. 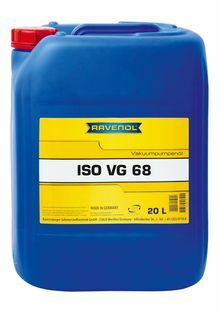 RAVENOL Vakuumpumpenoel ISO VG 68 is suitable for the lubrication of vacuum pumps (rotary vane pumps, diffusion pumps, turbo pumps), where mineral oils are required, as well as for mist lubrication and crankcase. RAVENOL Vakuumpumpenoel ISO VG 68 oil pumps can be used very well for the lubrication of crankcases. This vacuum pump oil should not be used in systems with silver or silver alloys. Excellent air release, which largely eliminates foam formation. Neutral from over plastic seals.